Resources Area is in English. Click here to preview. Info on record companies in Japan that distribute, import, license, and sell music from foreign indie artists, bands and record labels. All genres are covered (even Hawaiian, Classical, Brazilian/Latin, Reggae, Bluegrass/Country, Jazz/Swing, Jam Band, Hard Rock, Metal, Punk, Techno, Pop, Alt Rock, etc.). All addresses are translated/written in English. There are website/email links and additional comments written about each company. Click here to preview Resources Area home page. A Japanese cover letter (PDF file) which you can print and include with your packages so that they know why you sent it and who to contact (even though the other contents of your package may be in English or another language). The letter is generic so that it can be copied and sent to all the companies on the list. You simply write your name, genre and contact info where noted on the page. 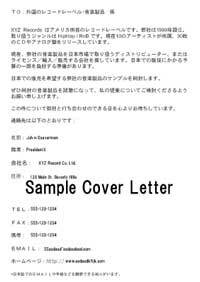 The Japanese cover letter is provided as a PDF file which when printed fits on one 8.5" x 11" letter-size paper (A4-size also available). - For artist / DJ / band just sending demos to Japanese record companies in hopes of getting "signed"